The word invoice is so common in the business world. We do not hear this every day, but it actually is a part of our lives. When we buy a cup of rice, there is an invoice. When we buy a drink at a convenience store, we receive the drink, together with an invoice. When we check in at a motel, we receive an invoice. Everything we do, an invoice is involved. Maybe except when we empty our bowel and stomach. Still, some store would give you an invoice for paying the peeing services. So it is like almost every time we buy, there is an accompanying invoice. And sometimes people call it a receipt. What exactly is an invoice? Is it an invoice or a receipt? There are many kinds of invoice. There is a standard invoice. And there is a commercial invoice. There is a progress invoice. And there is also a utility invoice. There is a pro forma invoice. There is a debit memo. And there is a receipt. And there are still many out there. Here, we try to take a look what a commercial invoice is and how does it differ from a receipt. But first let us go through these various kinds of invoices and see how they differ from one another. The term invoice has its origin from the foreign word envoy, to send goods. Contemporary meaning of the word invoice means, the written account or the documentation of the items, the particulars in a business transaction. So when someone buys something, there is part in that transaction a written documentation. As simple as that, there are actually specific uses for an invoice. It even gets complicated when you go through their various uses, as well as their alterations. Standard invoice. Nobody actually use the word standard invoice. We just simply say invoice. So generally speaking, this is invoice without quirks and nuances, a basic invoice. Progress invoice. There are cases when a transaction is not just for a one-time purchase, such as in a construction, when building a house, and it takes a stretch for a long period of time. Because purchasing the materials in a house does not happen in just one setting, as well as the service done by the workers, progress invoice is the one being used. So as the house project, for example, is in progress, the invoice keeps tracks of what is being spent and the services being rendered by the workers. Utility invoice. Electric bills, Internet bills, cable bills, water bills—these are the kinds of service that sends you a utility invoice. The thing with this invoice is that it tells you your due date, and the penalty you get for not paying on time. It shows as well the energy, or the services, you have consumed. Recurring invoice. There are types of regular services when the price is fixed, such as room or office rental, and the likes. So the invoice would be the same all throughout. Pro forma invoice. When a transaction is still ongoing, the provider or the seller may want to give the seller an estimate of the cost. Some would call this an estimate or a quote. The prices are not yet fixed and can still be arranged and adjusted depending on the final agreement between the seller and the buyer. Giving a pro forma invoice is a gesture from the seller showing of his available goods and materials that are ready for purchase, as well as his flexibility in the prices. Shipping invoice. When goods travel from one place to another, a shipping invoice may be what is needed. The other one that resembles like this invoice is the commercial invoice, which we will discuss thoroughly below. Pending invoice. There are cases when a buyer may have forgotten to pay the amount due in the past transactions, a pending invoice may well serve its purpose. It is sort of a reminder note for the buyer to pay. This usually happens when the payer pays in partial. In some cases, the remaining balance can be appended or added in the next invoice. There are still many invoice alterations out there, depending on which state you are coming from. But now, you already have a general idea what an invoice is. Basically, an invoice gives us a preview of what and how much the buyer may be paying or obliged to pay in a given list of merchandise. And commercial invoice is no different from the rest. But commercial invoice is also different in one sense. In an international trade, an involvement of customs is required. Ordinary domestic purchases, such as when you buy a cup of coffee, does not involve international agencies. But when you buy a sack of ground coffee internationally, from, say, Brazil to the US and vice versa, both require commercial invoice. 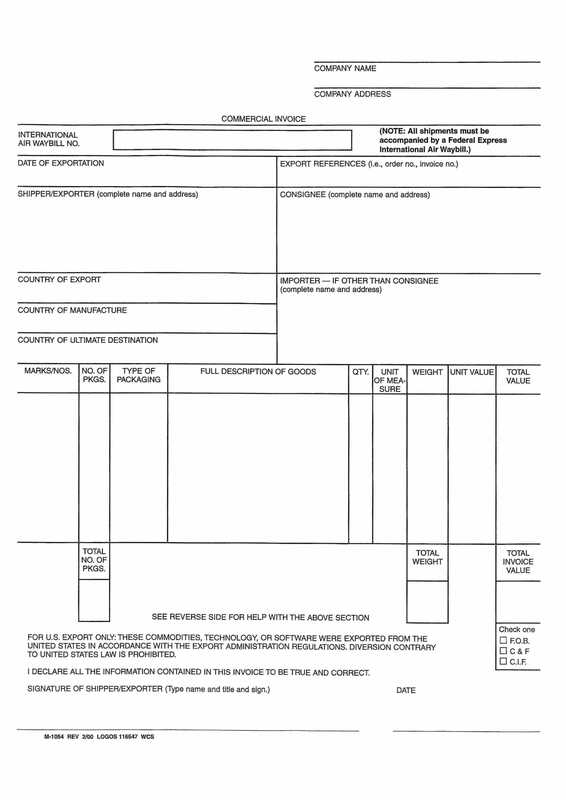 A commercial invoice may contain the same feature as any ordinary invoice, except that in the former, it includes the shipping details. By shipping details, it covers the name of the sender as well as the buyer, their address, and their contact numbers. Also included in the details are the name of the items, the kind of product, their price, the date it was shipped, and the expected date it will arrive. It will also include the tracking numbers of the package. The weight and the volume or size dimension will also be part in the details. Tax computation may also be different compared to any regular invoice because instead of the usual tax charge from your state or any country, in a commercial invoice, there can be as many taxes in a single shipping. 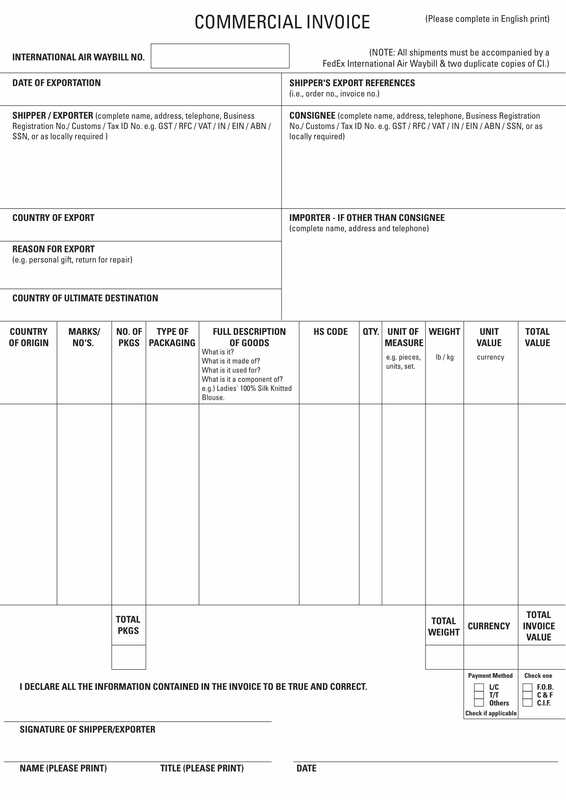 In a sense, a commercial invoice is the same as a shipping invoice, used when customs are involved. It is stricter and more detailed than any of those invoices mentioned in the above. But why the need of commercial invoice when you can just have a simpler shipping invoice? Why the Need for a Commercial Invoice? Commercial invoices may look complicated and tricky but it is for the benefit of both the provider and the buyers. 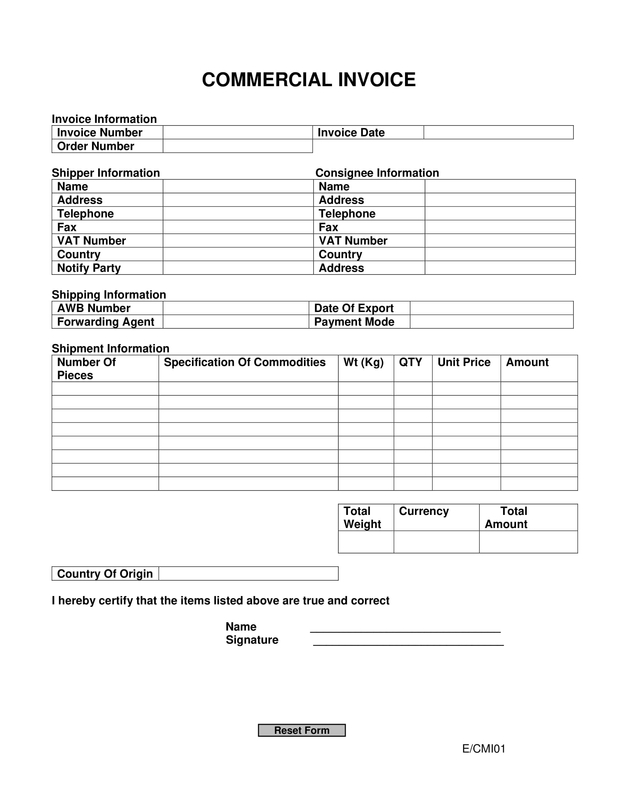 The one thing that a commercial invoice has advantage over that of a shipping invoice is the tracking. Tracking is very important when shipping items at a distance, inter-island level. And with a tracking number, it would not be too difficult for the recipient to claim for insurance, in case the package is lost. There is actually a commission created to regulating trade and commerce in international level. They set laws and limits so as to maintain order in between two different countries—the provider and the buyer. One is Incoterms or International Chamber of Commerce. Incoterms provide open communications between two parties such as setting the obligations of the sender to the buyer. But their role is limited, in that they do not set contracts or make payment obligations for any of the parties. There is also an agency that classifies items based on its names and uses. Harmonized Tariff Schedule or HTSUS makes regulation so as to quickly organize goods. The Department of Commerce also makes use of the Export Control Communication Number or ECCN. Here, the agency may determine if the item to be exported needs licensing. These are agencies that make trade efficient in the international level. So that is what commercial invoice is all about. So in your next shipping to other countries, remember all these nuances between shipping invoice and commercial invoice. 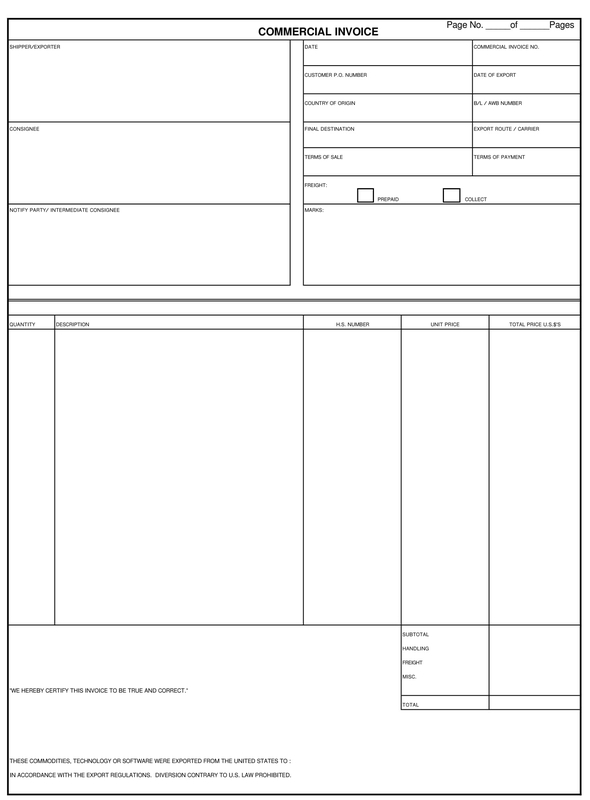 Should you want to know what a commercial invoice looks like, you can check some from the Internet. They vary from one state to another state. There may not be one format but the contents are just the same. There are names and the addresses of the sender and receiver. The name and classification of the goods are sometimes set in code numbers; for example, a computer may have this specific code number but a camera may have a different one. Also, the tracking number should be included in the packaging, but more so, the insurance of the item. The insurance value will correspond to the declared value of the item. If you are saving, you can declare your package item cheap and dispensable. But there is a risk. If the item gets lost, the insurance would also be minimal. Also remember that a commercial invoice is not a pro forma invoice. Meaning, any purchase requires registration. But it is also unlike a receipt that is too focused in the payment for the said item. In a commercial invoice, a seller may oblige buyers to pay, though it is not much about the transaction of payment. It may also help if you, as a seller, include a delivery invoice or delivery slip. That way you can be assured that an item reaches to its actual, intended destination. 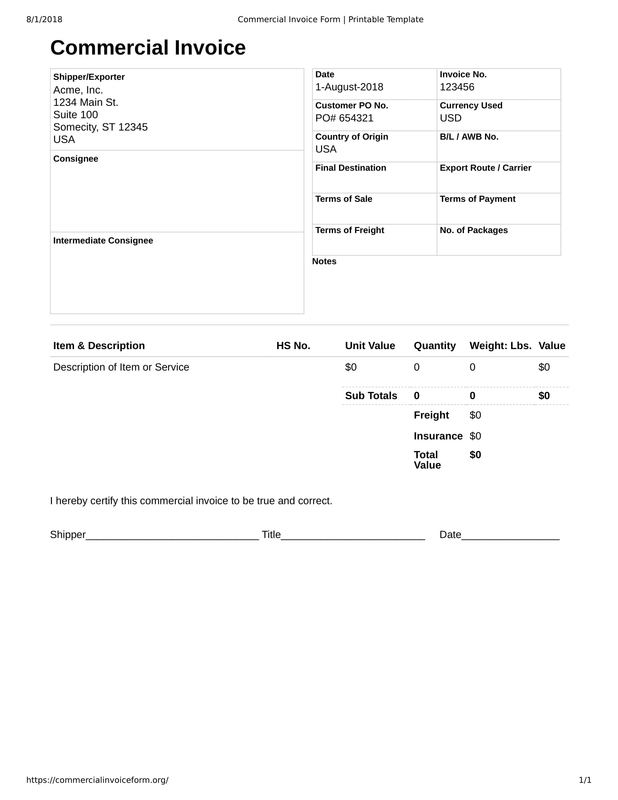 When an item is received, it will be confirmed by a signature of the recipient on the delivery invoice. You may check more commercial invoice online for some ideas.